Participants choosing coloured glass pieces for their kaleidoscope. 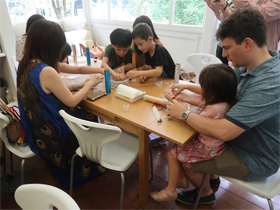 On 19 January 2019, glass artists Miss Hikari Sasaki and Mr Takashi Komiya of T.A.G gallery conducted a kaleidoscope workshop for the public. 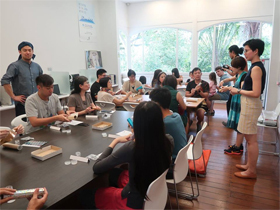 Using actual glass pieces, the attendees learned how to assemble the body of the kaleidoscope and were free to choose glass pieces of colours to their liking. It was a wonderful experience for both younger and older attendees, and everyone expressed delight and surprise at the beauty from the glass reflections in their newly completed toy. Artists Miss Hikari Sasaki (in light blue dress, standing on the right) giving instructions to participants and Mr Takashi Komiya (in a headscarf, standing on the left) with Miss Christine (in navy top, standing on the right), JCC staff to interpret. 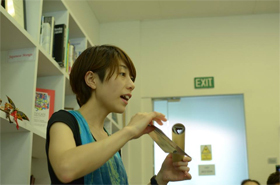 Artist Miss Hikari Sasaki giving instructions to participants. 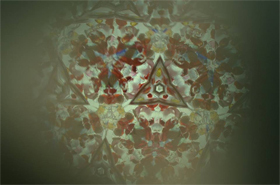 An inside view of the completed kaleidoscope.